Jessie Thurecht Hook '46 always knew education would open doors for her. At Elon, she worked in the registrar's office while studying biology and English. With little financial help from her family, she had no choice. "Elon was very accommodating to me and allowed me to work beyond the normal hours so I could earn more money," Jessie recalls. Jessie placed Elon in her estate plans before she died in 2014. Her gift will endow a scholarship in her name to help students with financial need. She said it was the least she could do to thank her alma mater. "Had Elon not helped me, I couldn't help Elon today," Jessie said. "Scholarships are very important because a lot of people need help to attend college. I can't think of any better use for my money that will do more good in the long run. I think it's a good buy for the buck!" Jessie made Elon the beneficiary of her retirement plan, enabling her to leave a legacy at the university and gain valuable income tax and estate tax savings. "I get tremendous personal satisfaction making this gift," Jessie said at the time. "I feel very proud and grateful to be able to do it, and I hope this inspires others to give." After graduating from Elon, Jessie worked her way through Emory University where she earned a master's degree in biochemistry before beginning her career as a lab researcher. 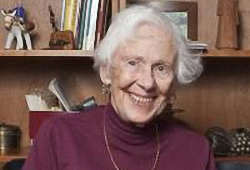 Later she married Edward W. Hook, former chair of the department of medicine at the University of Virginia, and raised four children in Charlottesville, Va.
"My education enlarged my perspective on many things," Jessie said. "I hope my scholarship will pave the way for students to develop themselves and use their abilities as well as they can." Jessie had fond memories of Elon and enjoyed watching her alma mater grow. "I made friends at Elon that I still have today," she said. "I'm very proud of what Elon has become."